There are some ‘perks’ that come with running sites like Malt Madness and Malt Maniacs. 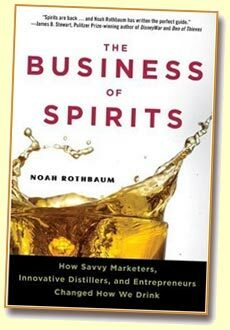 Although Davin is now our semi-official book reviewer (check out The Good Book for an overview) I still receive the occasional book – and the latest in the list was ‘The Business of Spirits‘ by American writer Noah Rothbaum. Initially, I wasn’t sure the book was particularly useful for the real ‘anoraks’; just one of the seven chapters deals with Scotch (single malt) whisky. What’s more, it’s perhaps not really aimed at an ‘international’ audience. A lot of the references and stories deal with brands and examples that may not be familiar to readers outside the US. For example, the ‘Grey Goose‘ luxury brand of vodka that’s mentioned on several occasions is sold mostly (some 95% of it) in the USA. as much as possible for it), the book offers a pretty good read. The book focuses heavily on the sales & marketing aspects of the spirits business – which makes sense given the title. If you want to get an idea about how ‘the industry’ perceives you, the consumer, this is an excellent read. Especially the story of the aforementioned ‘Grey Goose‘ vodka tickled my fancy… As you may know, vodka is a ‘clear spirit’ that, unlike whisky, doesn’t require any maturation. That’s a very good thing from the perspective of the producer; the vodka that is made today can be sold tomorrow. This means that they don’t have to invest vast amounts of capital in maturing stocks like producers of whisky and cognac. However, there was one problem with vodka: it wasn’t perceived as a ‘premium’ spirit, so consumers were unwilling to pay a lot of money for a bottle. For some two decades the ‘price ceiling’ for a bottle of vodka was around 15 dollars, set by the ‘deluxe’ brand Absolut. Absolut vodka was the ‘top of the line’ for a long time, priced around 15 to 20 dollars. However, a decade ago Sidney Frank (the US importer of the German ‘Jagermeister’ herb liqueur) jumped in. He felt that the American market was ready to pay much more for a bottle of vodka – provided that it was perceived as a luxury product. One of the justifications for the high price of a bottle of ‘Grey Goose‘ vodka (circa 30 dollars as opposed to circa 15 to 20 dollars for a bottle of Absolut) is the fact that it is produced in Europe. Not in Scandinavia, Poland or Russia though – it’s made in a purpose-built factory in France. The plant produces some 16,000 bottles an hour, the vast majority of which ends up in the US. The brand became a huge success on the American market – and all Sidney Frank had to do was add a much higher price tag to the bottle. The audience simply confused a higher price tag with higher quality – or at least with ‘luxury’. Sidney himself said: ‘Vodka is just water and alcohol, so if I sold a bottle for $30, the $10 difference is almost all profit.’ – but that didn’t stop the American market from embracing the new brand enthusiastically. So, the book is far too light on information about whisky to make it a useful investment for the ‘anoraks’ focused on whisky. However, if you’re interested in the ‘business’ aspect of spirits in general it’s a different story – especially if you live in the USA. The typically American flavour of the contents might make it a little harder to digest for an international audience, but even then the cover price of $24,95 could be wisely spent. From my perspective, ‘The Business of Spirits‘ by Noah Rothbaum is an excellent book if it keeps you from shelling out thousands of dollars or Euro’s (or the equivalent in your own currency) on one of those ‘super-premium’ single malts like the Ardbeg 1965.